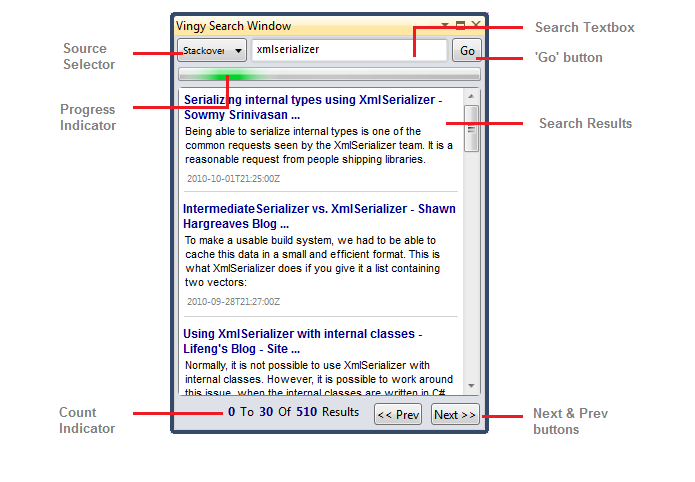 You can bring up Vingy either by clicking View->Other Windows –> Vingy Search Window from the Visual Studio IDE, or just by high lighting some text in the document and then clickingTools –> Search Selected Text (Ctrl + 1). So, after installing Vingy, high light some text in your editor and press Ctrl + 1 to start searching. You can use the Next and Previous buttons to browse through the results, and can click the Title of a result or the tiny ‘Open’ button to open the result in a full browser Window. Also, there is a progress ‘busy’ indicator to indicate if Vingy is busy.